I don’t think much of the retail trade report (and nor does the RBA) — however the December report has some trends worth highlighting. First, the value of retail sales is now trend declining — it’s the lowest level since July 2012, when cash payments were being spent. The 6mma is probably the best compromise betweeen the SA estimate and the trend (it’s a little more sensitive than the trend) — this moving average growth rate tells the story clearly: trend growth is weakest, including the GFC. Of course part of this is the structural shift onto online shopping, and hence out of the surve frame. Some like to take out food, as the price swings (I think it’s a good idea). 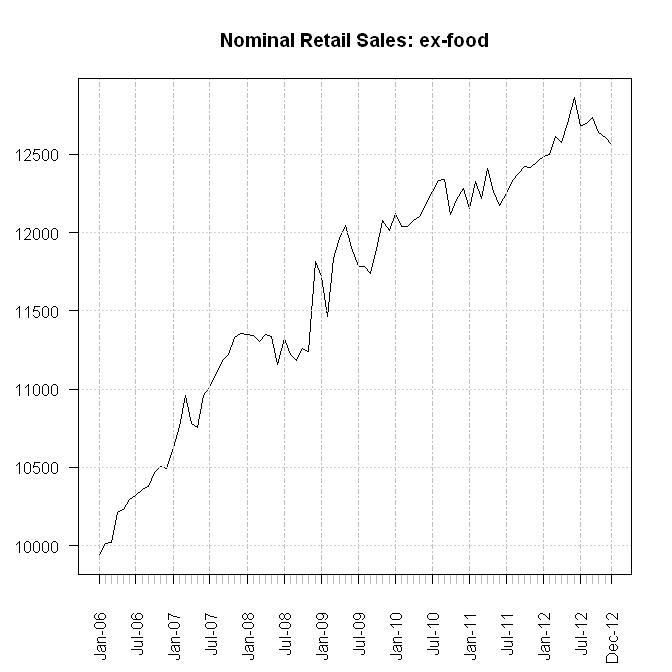 Ex food, the trend series has been falling since July, and the SA series is lowest since April 2012. The 3mma and 6mma declines are -0.5%m/m and -0.4%m/m (which makes an annualised pace of decline of about 5%). So while i think that retail is in general a junk statistic, i do think there are signs of unusual weakness that tell us something cyclical — this is almost certainly more than the ‘normal structural decline’ we expect to see in retail. This certainly seems a lot like the weak demand the RBA told us they needed to see if they were going to cut rates futher. Employment trends are obviously more important, but at this stage i’d say it’s up to the employment report to stop the RBA from cutting in March. 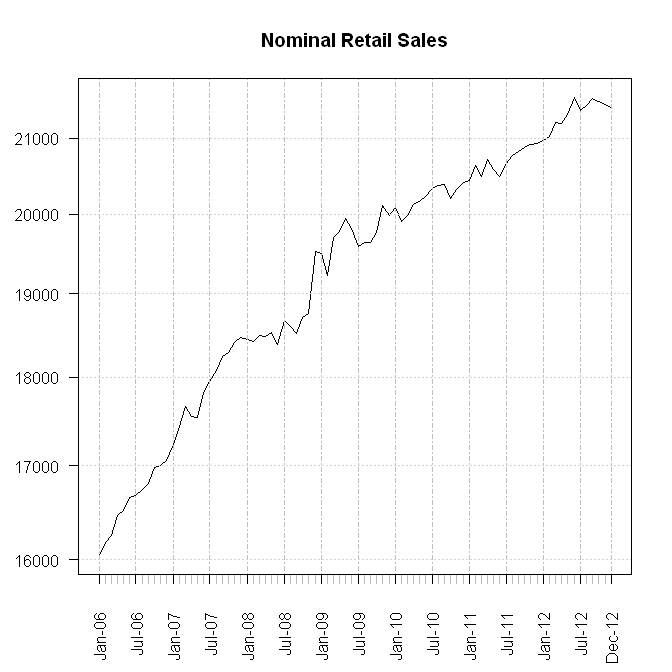 I know retail trade is weak but overall household consumption seems fine. People are simply spending on services. Household spending is still contributing what it normally does to growth. – Tourists are spending less in Australia due to high prices and incoming tourist numbers are not increasing. – Australian are traveling more and spending less at home. – Online shopping is growing. 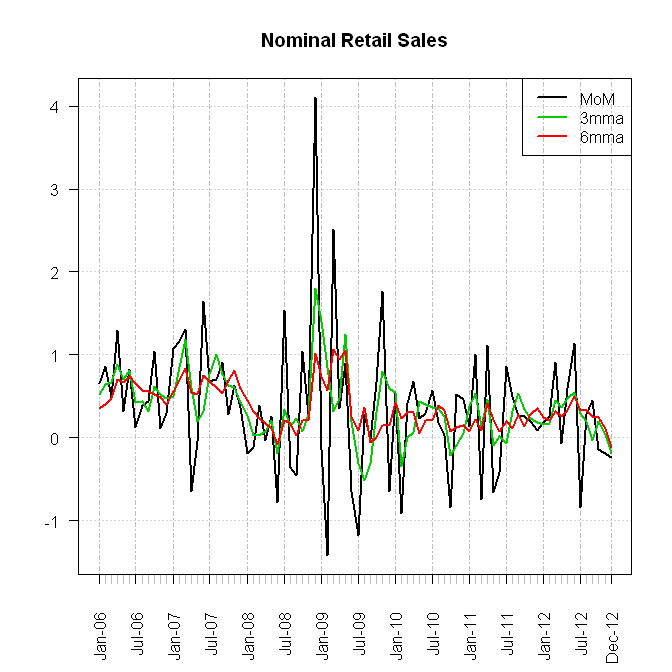 – Finally (and most important) retail sales seem linked to real estate prices. Where real estate prices are weak, retail sales are particularly weak (thinking of SA and VIC). BTW SA and VIC are in recession already. And tas has been in recession for some time. 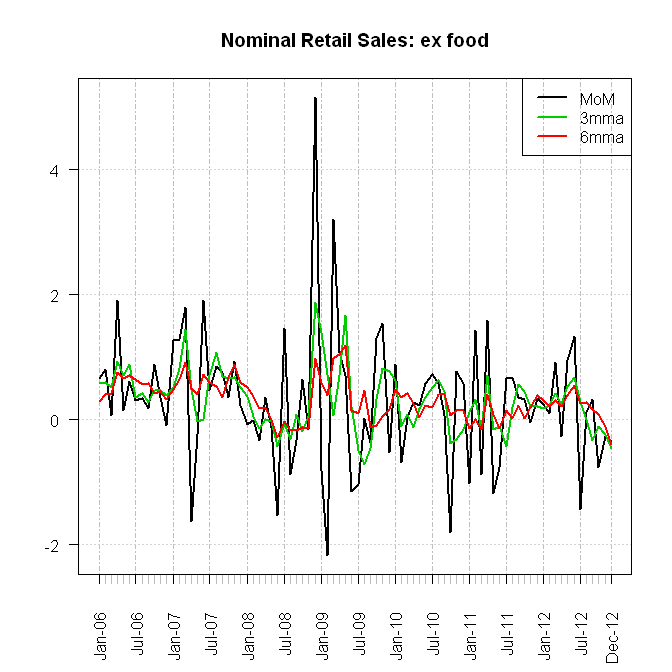 The US report seems to do a better job of tracking consumption – and as they have monthly non retail consumption, it is easier to get a feel for the other trends, so you can fill in the blanks a bit better. The Australian retail survey is too small, and consumption patterns are shifting away from the survey frame (to online, and non-retail consumption) so i don’t think it well captures what’s going on. The trends are informative, but the month-to-month is unreliable. The completely enumerated sector is much more reliable – but clearly there are issues with mix shifts. Weakish jobs report as well. Interesting that The Kouk first described it as “good”, then later “neutral”. Three months ago, he would have called the same number weak. Looks like he suffers from the same confirmation bias syndrome as CJ of describing every data release in accordance with his previously and loudly heralded stance. Although, of course, The Kouk is far from the worst offender. I wonder what Bloxham will say. The labor report was weak IMO: participation rates and hours worked down again. Full time jobs down too. If you look at total hours worked in SA and VIC, they are lower than Jan 2011. This matches retail sales yesterday and house prices in the last two years. NSW and WA are keeping the boat afloat. I wonder if it’s real estate impacting the economy or the economy impacting real estate in those states. Or is it chicken and egg? Ha – I made the same comment about the Kouk being in election mode a while back and our friend OYM begged to disagree. I agree CJ’s bias is personal rather than political, but his rather healthy ego more than offsets that advantage in my view. Rigour and humility are the keys to this game and they are the reasons Ricardo has me as a big fan. Shucks. I try. There is no money in being blind. Blox has goldilocks — which is hard to reconcile with trend 5k jobs. You need ~15k to stop the unemployment rate from going up over the medium term.